The Cycling Dude: From One End of Norway to the Other on a Highwheeler! From One End of Norway to the Other on a Highwheeler! 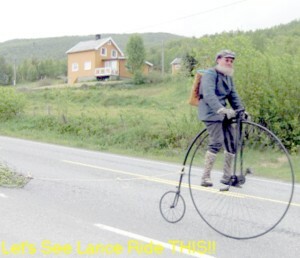 Jan Paulsen loves 19th century Bicycles (He's got several, not to mention old Motorcycles.). This past summer he rode a Highwheeler from Northcape to Lindesnes, all of Norway lengthwise, in 31 days. Some might call this enterprising Norwegian a madman. I hear you say..."Why should I check out his website, and related pages, I can't read, or understand, bloody, freakin' Norwegian! The pictures, dear reader, the pictures! Then explore the rest of what his site has to offer. Although a great fan of the vintage bicycle, I'm not sure I could muster enough guts to get on one of those things! He looks at ease though doesn't he?